Farrar has speed to beat Cavendish, says Garmin’s Weltz. I'm a buddhist till the last 1000 meters. Boy Racer versus the Battling Buddhist. It could be the sprint match-up of 2010. Columbia’s Mark Cavendish going kick-to-kick against Garmin’s Tyler Farrar. Is the young rider from Wenatchee, Washington catching up to the fastest sprinter in he world? Mark, you hear that over in the Canary islands where you’re training? Cavendish made a point last year of tweaking Garmin and Farrar constantly. It was a running joke at Team Columbia and there’s no love lost between the two American squads at odds. After a frustrating string of near misses, Farrar finally got his first Grand Tour victory in stage eleven of the Vuelta a España. He also knocked off three wins in the Eneco Tour and stage three in Tirreno Adriatico where he beat the Manxman at the line. In the classic Western True Grit, bad guy Robert Duval laughs off John Wayne’s bold statement that Wayne will arrest him — “I call that bold talk for a one-eyed, fat man.” Twisted Spoke things Cavendish better watch the wise cracks next year. 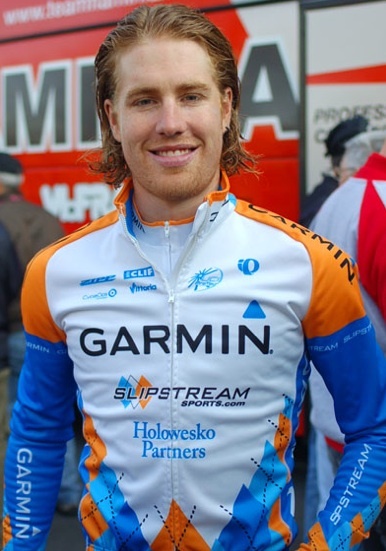 Tyler Farrar is closing and closing fast. « Joe Papp, doping, culture, EPO sludge. It’s the smile,a dead giveaway. Similar to a time trial bike that reeks speed. Nothing braggadocio, simply fact. Tom, that was like haiku, bro. Your words left me confused but strangely wanting more.